Former UN secretary general who is also the Chair of the AU Panel of Eminent African Personalities has urged the government to fast truck constitutional implementation ahead of the general elections. In a statement to commemorate the second anniversary of the promulgation of the Constitution, Dr. Kofi Annan, said the outstanding issues in the Constitution relating to police reforms and gender representation should be addressed fully before the elections. Dr. Annan who successfully brokered the coalition government in 2008 outlined some of the key areas that need attention before the general election; police reform, in particular the creation of the National Police Service Commission and the appointment of the Inspector-General of Police as well as the conclusion of the process to appoint commissioners to the Ethics and Anti-Corruption Commission. “It is also critical that the issue of gender representation within the National Assembly receives the attention it deserves and is authoritatively concluded before it affects the electoral preparedness timetable. We are confident, however, that these and other outstanding tasks will be completed,” he said. 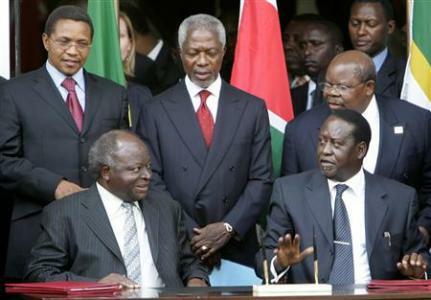 Mr Annan said Kenya’s greatest challenge was ensuring that the implementation of Constitution will also address the issues that triggered the Post-Election Violence of 2007/8. He also touched on thorny the issue of integrity coming days after the parliament diluted the much anticipated Integrity bill. “The comprehensive implementation of the Constitution is the roadmap by which the people of Kenya overwhelmingly wish to see the nation guided. They wish to see the national values and principles of governance upheld to include integrity, transparency and accountability. The need for elected and appointed State officers to be leaders of integrity, as required under Chapter 6, is critical. Ensuring democratic and accountable exercise of power, and extending powers of self-governance to the people through devolution are equally vital,” he said. He called upon key institutions mandated with managing the polls to ensure free, fair, credible and peaceful elections that will retain the confidence of the people of Kenya as they discharge their respective responsibilities. “The next General Election is about more than just ensuring that the electoral process is transparent. The credibility of the polls will also be determined by the level of nationwide participation. The elections must be viewed by all Kenyans as a national civic responsibility and opportunity to determine their future,” he said. The statement by Dr Annan comes as parliament rushes to conclude key bills that will operationalize the new constitution ahead of the March4, 2012 general election. In Parliament MPs questioned why it took the government too long to table key bills, making them go for extra sessions deep into the night to beat the deadline.